COCHON 555 (five chefs, five pigs, five winemakers), a unique traveling culinary competition and tasting event, marks its sixth anniversary tour. Created to promote a national conversation around the sustainable farming of heritage-breed pigs, each event challenges five local chefs to prepare six dishes for pork-lovers. The menu is based on the entirety of one 200-pound family-raised heritage breed pig, nose-to-tail. A panel of 20 expert judges and guests of the event will vote for the city’s “Prince or Princess of Porc.” The winner from each city goes on to compete for top honors in the Grand Cochon at the Food & Wine Classic in Aspen in June. The winner of the finale receives bragging rights as the “King or Queen of Porc” and a 4-day wine experience to Rioja, Spain’s most prominent wine region. The COCHON 555 event is 100% inclusive and always on Sunday. In 2014, ticket buyers are invited to enter to win a VIP trip to Rioja Wine & Tapas Festival in New York City, a trip to Heritage BBQ in September, or more than $3,000 in prizes from partners, including a Smart-Scoop Ice Cream Maker from Breville, a $1000 bottle of Reserve Bourbon from Breckenridge Distillery, a chance to be a Punch Kings Judge and 2 VIP tickets to Cochon 555. Twenty judges as well as guests help decide the winning chef by voting on the “best bite of the day.” This year’s event includes the launch of a cocktail competition called “Punch Kings” featuring Breckenridge Bourbon, with six local bartenders. Cost is $200 for the VIP tickets, opening at 4 p.m., and $125 for general admission, opening at 5 p.m. For more information, visit amusecochon.com. I attended the 4th ANNUAL COCHON 555; the ultimate 2012 Swine, Wine and Dine Event was held in Chicago! “COCHON 555 is a national event series that takes place in 14 major cities across the country created by Taste Network ‘s Brady Lowe in 2009 in response to the lack of consumer education around heritage breed pigs.” Every January, C555 embarks on a 10-city culinary competition and tasting tour where 50 chefs compete. The 2012 Grand Cochon winner was Nightwood’s Chef Jason Vincent of Chicago! BRAVO JASON!!!!! Competing chefs for the Grand Cochon title included: Marc Forgione (NYC), Lars Kronmark (Napa, Calif.), Kelly English (Memphis, Tenn.), Naomi Pomeroy (Portland), Jamie Bissonnette (Boston), Michelle Bernstein (Miami), Scott Drewno (Washington, D.C.), and Ben Ford (Los Angeles). The Cochon 555 Journey begins every January. The 10 city culinary competition selects five chefs from 10 cities to prepare a snout to tail menu from heritage breed pigs. The ultimate victor is crowned in Aspen. 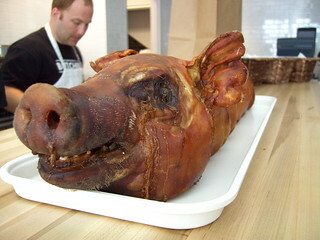 The King or Queen of Porc will receive a 2012 Guest Chef Showcase weekend at Blackberry Farm in Tennessee. COCHON 555 is a one-of-a-kind traveling culinary competition. There are five chefs, five pigs, five winemakers and tasting event to promote sustainable farming of heritage breed pigs. The event challenges five local chefs to prepare a menu created from Heritage Breed Pigs, nose-to-tail, for an audience of pork-loving epicureans. Carlos Gaytan of Mexique, Danny Grant of RIA and Balsan, Stephanie Izard of Girl and the Goat, Mike Sheerin of Three Floyds and Jason Vincent of Nightwood. Cochon 555: I loved Yorba’s Barbera! Participants were treated to an an epic pork feast of five whole heritage pigs prepared by five chefs. There were wines from five family wineries including: Chase Cellars from California with a vibrant Zinfindel; Elk Cove Vineyard from Oregon with incredible Pinot Noirs from the Willamette Valley; Buty Wines from Washington poured an excellent Cabernet sauvignon and syrah blend and Yorba Winery from Callifornia’s winemaker scored a home run with the Barbera. I loved the winemaker’s leopard scarf the Scholium Project ! The evening will also include wines from SALDO, Cornerstone and a blind tasting contest from Robert Kacher Selections. I watched an interesting butcher demonstration from Rob Levitt of Butcher & Larder. Many people tried to guess the ingredients from Andrew Zimmerman of Sepia pot to win cookware from Le Creuset. The event included beers from Anchor Brewing and tastings of Chinaco Tequila and Three Floyd’s Beer. Anchor Brewing from San Francisco was the national beer for Cochon 555 2012. Many people enjoyed a “Perfect Manhattan” from the Cochon 555 Templeton Rye Bar bar with Daniel Hyatt of Alembic SF featuring Templeton Rye, Hirsch, Angel’s Envy, Eagle Rare, Buffalo Trace, Hudson Whiskey’s Baby Bourbon and Luxardo. Kevin Hickey from Allium at the Four Seasons Hotel prepared a feast at the end of the evenilng. He served a Heritage BBQ whole hog family meal. The Cochon 555 Tour culminates in a grand finale at the 30th Annual Food and Wine Festival in Aspen , Colorado. 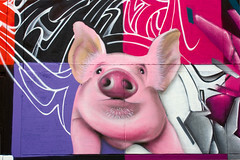 At the Grand Cochon there will be: 10 Chefs, 10 Pigs and one Crown on Sunday, June 17, 2012 at 3:30 p.m.
“The finalists will each prepare dishes from a whole heritage-breed pig in this “head to toe” competition. The winner is determined by 450 guests and a panel of 20 esteemed judges. The event includes over thirty winning chef dishes from around the country, butcher demos, reserve wines, artisan cocktails, pig infused desserts and the award ceremony.” There will be a tasting of Domaine Serene reserve wines paired with the coveted Spanish pork, Ibérico De Bellota by Fermín imported by Wagshal’s Market. Enjoy the wines of California from West Sonoma Coast Vintners with brews from Anchor Brewing. Please call 888.649.5982 for more information and to buy tickets. There are 2 more events before the ten winning regional chefs face-off to determine the ultimate victor at the Grand Cochon. The next 2 stops include Los Angeses on May 6, 2012 and San Francisco on May 2, 2012. Get Your Tickets for the Memphis BBQ Today! A three-day celebration of heritage pork, National Bourbon Month, and BBQ, an American-and a Memphis-tradition. Festivities include fine-dining BBQ experiences, interactive demonstrations & panel discussions, food artisans & producers, craft beers, family-owned wineries and craft distillers. Heritage BBQ will be a first-of-its-kind competition that pits 24 fine dining teams in the ultimate heritage breed pig BBQ cook off while celebrating National Bourbon Month and all things craft American and tasty including oysters, bacon, dinners and music to remember for a lifetime. Best yet, it happens every Labor Day moving forward.